Communication sophomore Ziare Paul-Emile performs “Don’t Touch My Hair” by Solange. The event on Monday was the beginning of the “college takeover” initiative of the “Black Lives, Black Words” international festival. Amira Danan said she does not often have the opportunity to surround herself with many fellow black students on campus. So when the opportunity came to work on Northwestern’s “Black Lives, Black Words” project, she said she was excited to fully immerse herself in the university’s black community. Reginald Edmund, founder of the festival, brought the project to Northwestern after working with NU theater Prof. Aaron Todd Douglas. Douglas, the associate artist for the festival, recruited student contributors along with Laura Schellhardt, who heads the Northwestern Playwriting Program. Douglas and Schellhardt said most of the students involved did not seem to know each other well before the project. Schellhardt said she was thrilled to see her vision of fostering a community, both among the performers and with the audience, come together with the performance. Danan’s piece, “Milk,” depicted a young girl struggling to accept her black identity. Though she initially compared the nature of her hair and skin to those of the white girls at school, her mother empowered her to see the beauty in her own identity. The other six plays touched on a variety of themes, from the experience of being black in college to celebrating individuality. Communication sophomore Ziare Paul-Emile performed an opening song, “Don’t Touch My Hair,” by Solange. Many of the other pieces involved music, Danan said. The event ended with a reading of “Still I Rise,” a poem by Maya Angelou addressed to the white oppressors of black people. Communication sophomore KZ Wilkerson read the majority of the poem and led the audience in a call-and-response portion. Edmund was “incredibly proud” of the students for speaking out and sharing their voices. He said he believes their generation will change the world in terms of race relations, so it is important for them to be empowered. 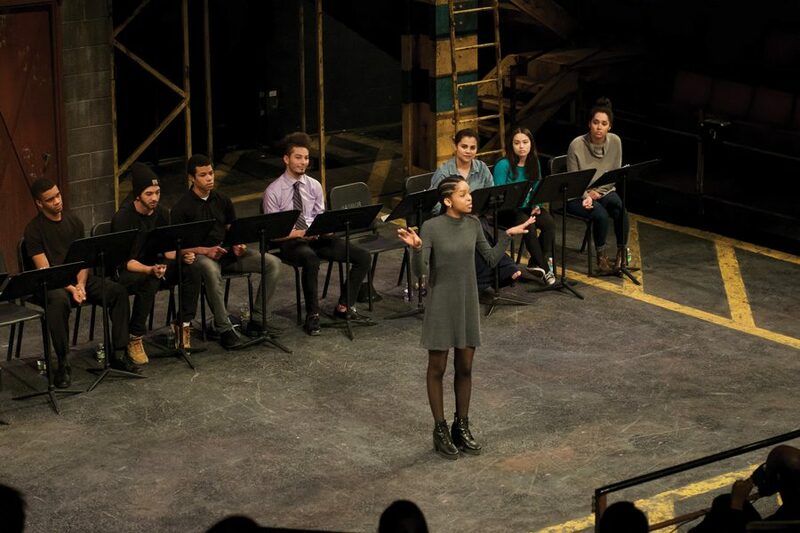 “Hopefully there’s a spark that has been ignited within these writers, to not just write plays but also to be activists and to be critical thinkers and builders for the what the future of theater could look like with their voices,” Edmund said.